If your door is sticking it can be a bit of a nuisance. There may be one of several causes. 1 The first thing I check is that the hinges are still well attached to the door and door frame. Some times they will loosen with the weight of the door which causes the door to slump slightly. If that's the case replace the screws with slightly longer or fatter ones and it should tighten up. The first thing to do is identify which part of the door is sticking. Open and close the door slowly and try to see where it sticks. You can usually see wear marks where wood is rubbing on wood or scraped paintwork. Mark the areas in need of attention with a pencil. 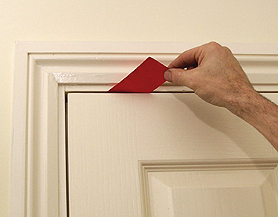 Tip If the sticking point is not obvious, with a thick piece of paper see if you can slide it along the gaps between door and frame, along top, bottom and opening side. You will be able to feel it binding where the door is sticking. Identifying non-obvious sticking points with a piece of thick paper. Planing a bit off the bottom of a door with an electric planer. The arrows show the direction to plane if you're going across the grain. 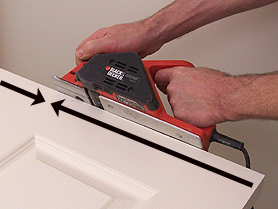 Tip If you're planing the bottom of a door that usually means you'll be planing across the grain of the wood. If you plane right across the door from one side to the other sometimes the wood can split at the far side and take a big chunk off the side of the door. To avoid this its best to plane half from one side and half from the other.